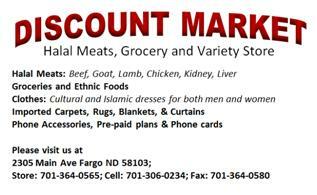 The Islamic Society of Fargo-Moorhead (ISFM) is a non-profit 501(c) (3) organization serving the Muslim community of approximately 6000 in Fargo, North Dakota's largest city and its surrounding region. ISFM is managed by elected volunteers. Our new masjid is located at 601 28th Street S., Fargo, North Dakota. Click here to locate our new masjid. You are most welcome to observe our services and attend the Friday sermons for better understanding of Islam. Please contact with the Masjid officials. Alhamdulillah we opened the New Masjid on the night of 20th Ramadan 1434 AH (Monday July 29th, 2013 AD). Jazak Allah Khair to you all for your generous contributions; May Allah reward you.